Atop 3584 mts, this is one of the Char Dhams and one of the busiest pilgrim centres in the Garhwal Himalayas. It is believed that in order to evade the Pandavas, Lord Shiva hid himself in the form of a bull at Kedarnath, and when found by the Pandavas, he went further into the earth leaving the hump on the surface. Kedarnath is popular for its ancient Shiva Temple, shrines, Himalayan ranges and undulating landscapes. Marked by the Kedarnath temple, near Chorabari Glacier, the area is flanked by the Kedarnath peaks and countless more ranges with peaks silver with snow. The most remote of the Char Dhams, and maybe hence, one of the most majestically beautiful, Kedarnath remains closed for the six months of winters due to unbearable temperatures and heavy snowfall. The Kedarnath Temple, located on the Garhwal Himalayan Range in the Rudraprayag District of Uttarakhand, India, is one of the most prestigious and sacred Hindu temples. Situated at a height of 3,583 metres, the temple is the highest among the 12 Jyotirlingas and is dedicated to Lord Shiva. It is also included in the Chota Char Dham besides Gangotri, Yamunotri and Kedarnath. Set amidst the snow-clad and lofty mountains with Mandakini River flowing in front of it, the Kedarnath Temple witnesses lakhs of devotees every year due to its religious significance and sanctity. 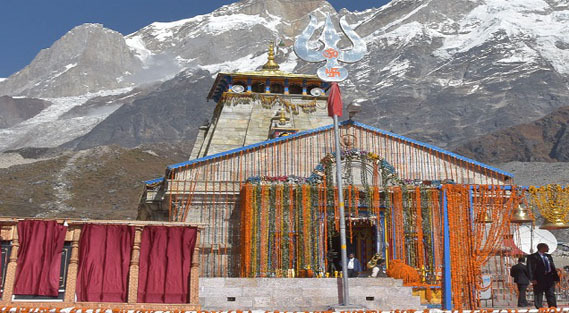 The present Kedarnath Temple is believed to be re-constructed by Adi Shankaracharya, originally built by the Pandavas thousand years ago from enormous stone slabs over a large rectangular dais. Kedar is another name of Lord Shiva, the protector, and the destroyer. It is one of the holiest shrine dedicated to the deity and it is believed that a journey to this holy land opens up doorways to "Moksha" or salvation. This abode of Lord Shiva can only be reached from Gaurikund through a trek and therefore, Kedarnath Temple is a treat for trek-lovers too. The mesmerizing views of Himalayas around, the balmy weather and pure ambience gives you a feeling of ultimate euphoria. The zeal of devotees just to get a glimpse of the lingam is worth admiring. The interesting history, the spiritual value and the fascinating architecture are amongst many reasons to visit Kedarnath Temple. A lake at an altitude of 4135 meters, Vasuki Tal offers a view of the neighbouring Chaukhamba peaks. Trekkers would find this an ideal range o climb up. The Chaturangi and Vasuki glaciers can be found en-route to the lake. It is believed that Sri Sankaracharya who propounded the Adwaita Philosophy established this holy shrine and one of his four Mathas in the 8th century and attained Nirvana at age 32 here. Dedicated to Saint Agastya, the temple commemorates his one year Tapas (mediation) here. This ancient temple stands as an example of grand architecture and interiors with wall art adorning its walls. Atop 1829 m. Sonprayag is a tiny hamlet on the confluence banks of rivers Mandakini and Basuki. Devotees take a dip in the holy waters with the faith to attain nirvana. Located atop 3679 m. Chandrashila offers an excellent trekking range and skiing tracks throughout the year except in December and January. A Shiva temple adorns the peak of this mountain.